I know nothing about Sheffield FC I'm ashamed to say ! Please post your information, memories and pics and educate me ! The worldï¿½s very first football club was born in Sheffield on October 24th 1857. Football in some form had been around for years. As early as the 14th century, a game was being played in the streets and fields of England by two teams with a ball. Mob Football, as it was known, was very violent and could be played on pitches that ran the length of the town with anything up to 500 players. By the mid 19th century the game had evolved, but it was still nothing like the game we know and love today. It wasnï¿½t uncommon for 20-a-side games to go on until dusk and there wasnï¿½t even a standard set of rules. People in different towns played by completely different laws to each other. Everything changed in May 1857 when two keen cricket lovers, William Prest and Nathaniel Creswick, chatted late into the night about the need for an organized sport to keep their fitness levels up during winter. They decided on football. Five months later the worldï¿½s first football club was formed. Offices of the club were elected, with Creswick named as Secretary and Captain, and headquarters were established in a potting shed and green house at the bottom of East Bank Road. The first thing Sheffield Club did was to study the existing sets of rules and lay down its own code of laws, which were the foundation stones for the first commonly accepted set of rules. Sheffield Club attracted a lot of interest and members organised themselves into teams so they could play matches, like Married Men vs Unmarried Men and Professional Occupations vs The Rest. Soon other clubs began to spring up and by 1862 there were 15 clubs in and around the Sheffield area. The following year, the first association of clubs was set up. Sheffield Club were instrumental in the formation of the Football Association, of which they were founder members and are still members to this day. Sheffield FC has pioneered many innovations in football over the years. Heading was unheard of in the south of England until 1875. When Sheffield travelled to the Oval to play London, the sight of the Sheffield players butting the ball reduced Londonï¿½s players and fans to fits of hysterics. In those days the crossbar was just a length of rope strung between the uprights. The Sheffield Laws introduced, for the first time, the notion of a solid crossbar. Other innovations included the first use of corner kicks, the first free kicks for fouls, the first proper throw-ins and the first floodlit match. Sheffield FC was closely involved in the formation of Sheffield United in 1889. They provided some of the players for Unitedï¿½s early games and used to join in practice sessions with the United professionals. Over the next few years, professionalism took over the game and Sheffield Clubï¿½s imprint on the national game diminished. Sheffieldï¿½s finest hour on the pitch came on April 4th 1904, when they beat Ealing 3-1 in front of 6,000 fans at Valley Parade to lift the FA Amateur Cup. In 1957 Sheffield FC became the first club to reach the magic 100 years old mark. To celebrate, a Sheffield XI played an England XI at Hillsborough and a banquet was held at Cutlerï¿½s Hall attended by HRH The Duke of Edinburgh and Sir Stanley Rous. On the pitch successes have been few and far between, but in 2001 the club regained the FA Amateur Cup they won in 1904 and recently progressed to the Fourth Qualifying Round of the FA Cup for the first time since 1959. Off the field huge progress has been made in securing the future of the worldï¿½s oldest club. When Richard Tims became Chairman, he set the target of making the club financially self-sufficient. Not only are the club now on a sounder financial footing than ever, but they also now have their own ground for the first time in their history. Now thereï¿½s two senior teams, nine junior teams, one womenï¿½s team and one disability team plying their trade at the clubï¿½s Bright Finance Stadium in Dronfield on the outskirts of Sheffield. And with a global membership scheme and website recently launched, it seems that at last, the club with the illustrious past has a future to match. 1861--The first inter-club football match was held at Sheffield between Sheffield and Hallam. Sure this has been asked somewhere on the site, so an answer without a question! I think the Hallam ground at Sandygate is the oldest ground in the world that is still being used as a football ground. Well knowing very little about football, I copied this some years ago, whilst researching family history. Having suffered so decisive a defeat at the hands of London on Saturday, it is presumed that Sheffield did not look forward to their match of yesterday too confidently. They won the toss, and left their opponents to kick off towards the high ground. So well was the ball followed up that Sheffield at once to fall back on their goal, which narrowly escaped. Mosforth relieved the Northener's lines, but the counties returned to the charge, and a shot by Wilks caused Whelan to use his hands. Sheffield were then seen to better advantage, and passing well their forwards soon gave the home backs plenty of work. The kicking of Welch and Field proved very useful, but to the excellent judgement of Hawtrey in goal must the escape of the Berks and Bucks on several occasions be attributed. Bambridge, Keyser, and Parry were most industrious on behalf of the combination, and principally through their efforts the Sheffield goal was more than once assailed. During the first half matters were rather in favour of the visitors, but ends were changed without a definite point being recorded to either side. Sheffield commenced the second portion of the contest by penning their opponents, whose lines were at last relieved by Bambridge, who shifted the ball to Keyser, and the latter only just missed the Northerner's post. The Yorkshiremen were on their mettle, and several well organised attacks resulted in Hawtry again having to use his hands in defence of goal. Following one of these incursions Lunnon came away on the left, and after a capital run passed the ball to Parry, whose smart shot secured the first goal for Berks and Bucks. As if encouraged by this success, the Southern team played in most determined fashion, and a second goal was soon placed to their credit by Keyser, who had recieved valuable assistance from Bambridge. The last named player then effected a fine run, but his final kick sent the leather just above the tape. A certain looseness in the ranks of Sheffield was noticeable about this period ; but later on they were better together, and twice it fell to Hawtrey to save the home goal. Then a corner kick was gained by the counties, and so well was it executed by Shaw that Lunnon was able todirect it between the posts. Scarcely had the ball been again set in motion when Bambridge took possession, and without ceding it shot under the bar. This proved the last important incident of the match, which resulted in a victory for Berks and Bucks by four goals to none. Referee, Major Marandin R.E. ; umpires Messrs. J.E.Deans and Martin. L. Keyser, W.Holbrook (Reading), R.Shaw (Marlow), and R.A.Lunnon (Marlow), forwards. Sheffield Football club is 150 years old and the aniversary will be marked today. Scotland and England have been locked in some epic footballing battles â€” and a new one is emerging over who can lay claim to the worldâ€™s oldest football club. Until now, it was thought Sheffield FC held the accolade, having been founded in 1857. However, newly uncovered documents reveal the Football Club of Edinburgh was in existence 33 years earlier. Papers held in the collection of an Edinburgh lawyer, and recently obtained by the National Archives of Scotland, show a list of players from 1824, as well as the clubâ€™s expenses account from its first season. 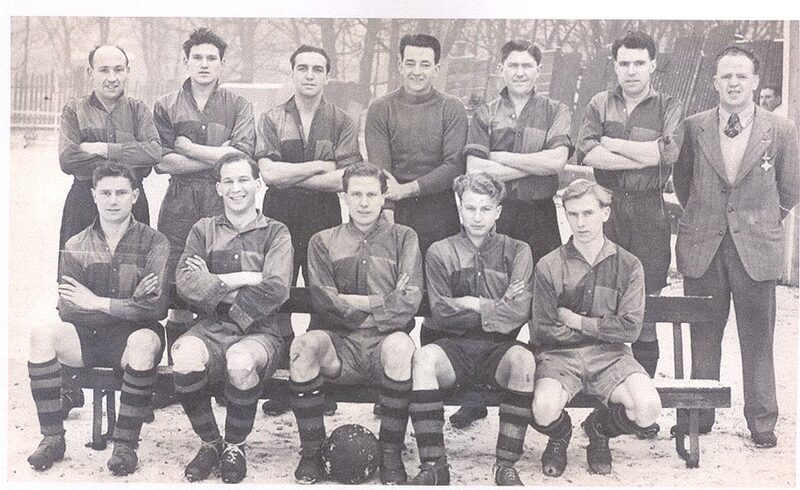 Here's a picture of a Sheffield FC team from the early 1950s. I wonder if any of them are still around --or if anyone knows anything about any of them. The captain of this team was Harry Parkin (back row extreme left) and the trainer was a chap called Frank Fagan (back row extreme right). Frank had a son called Michael, and they lived on Baker Street, Attercliffe. Sheffield FC are on the brink of qualifying for the first round proper of the FA Cup for the first time following their 2-1 victory over Frickley Athletic in midweek. It means Chris Dolby's side are through to the the fourth qualifying round having overcome Colne FC - in the preliminary round, Woodley Sports and Northwich Victoria this term. A bumper crowd is expected when Club lock horns with Tipton Town FC next Saturday at the BT Local Business Stadium in Dronfield. Kick-off is 3pm. Adult tickets are priced at £6 while concessions are £3. Shame; one day it will be history when they do make it. Early news from the sale is that the rules sold for £750,000.!!!! The BBC have it at £881.250 . The last copy of the Laws of the Game I bought was about £881,245 less than that. Who, and therefore why ? Individual/Organisation/Investment ? Bidding history ? One killer bid before the auction started or a battle ? and where does ir rank in the world's most expensive books/bits of paper ? A Plate 77 Penny Red springs to mind ... for size/price pretty remarkable and there is another more expensive stamp which eludes my mind at present. First edition King James Bible maybe ? DaveH's favourite authors hand-written copy of Twelfth Night - complete with Ovaltine stains ? Is in still in the country ? and what of Thomas Pierson - the original owner. "Sheffield FC were formed 24th October 1857 at a meeting held at Parkfield House in Highfields. This was the home of Harry Water Chambers, another solictor, who for some reason despite his pivotal role did not appear on the original committee. 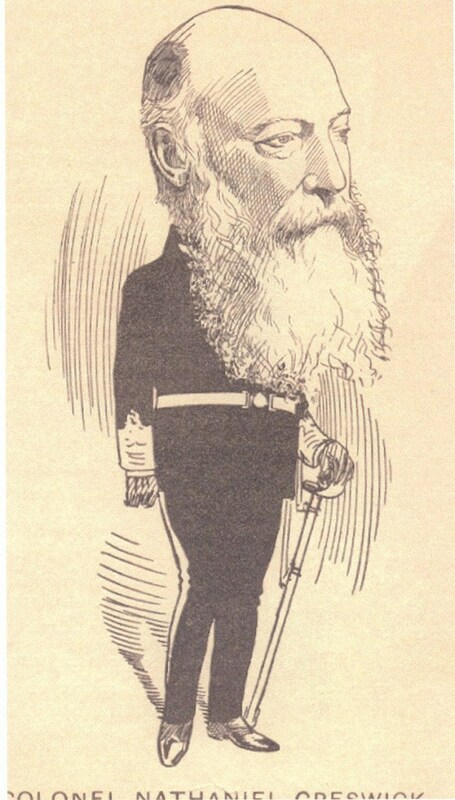 He did however become club secretary at a later date and was the Club's representative at the meeting in London which led to the formation of the Football Association in 1863. Another solictor Thomas Pierson was a member of the original committee as was Frederick Ward, son of a past master Cutler Thomas Asline Ward, who was the Club's first president. The two vice-presidents were TA Sorby & Joseph Ellison, like Ward prominent local manufaturers and the committee also included Tom Vickers, a leading steelmaking figure. " Residing at ~ Lawson Road, in 1871. 1881 Census - the Sheffield FC one must have been his dad! Pierson, Thomas jun. (, Attorneys). Residing at 1 Paradise Square, in 1828-9. Recorded in: Pigot's Commercial Directory - 1828 to 1829. Pierson, Thomas jun. (, solicitor). Residing at 1 Paradise Square; h. Waterhouse Row, in 1833. Recorded in: Whites History & Directory of Sheffield - 1833. Residing at 1 Paradise Square; h Western Bank, in 1837. Your right in identifying both Harry Parkin and Frank Fagan. Frank was also a clean boxer and the players used to be petrified when he used to call them into his office, a story told to me by former player Norman Cann who played for Sheffield in the 50s. Front Row: Bill Benson, Alan Smith, Tommy Graton, Keith Smith, Peter Copley. Not sure if Alan Pashley is still alive but I know he was certainly still a visitor at the Sheffield FC games upto the season before last (2010). There is a reference earlier in this thread to Harry 'Water' Chambers - actually Harry Walker Chambers. A few months before his death in 1907 he spoke at length about his football career and these reminiscences were included in his obituary (the Star, 23 Dec 1907). Apart from his early sporting exploits he was also a solicitor and a brewer.